Use this delicious slow cooker Mexican pork in Mexican cooking recipes such as Chilies Rellenos, Chimichangas and tamale recipes. 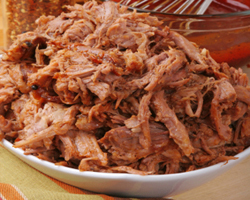 Just click on these links to find some wonderful recipe suggestions to use this prepared pork with. It freezes very well. Have some on hand at a moments notice. If planning on freezing some, you may want to double the recipe. Then freeze in 2 cup portions. and salt. Add enough water so that the roast is mostly covered. At this point you can put the pork back into the crock pot and add the cans of green chilies, couple cans of pinto beans, heat through and serve with flour tortillas and your favorite toppings.